The new collection provides an overview of my current interests in both subject matter and technique. These poems, I hope, show a comfort level with a wide variety of themes and with a wide range of technique. On a very personal level, the biggest difference between the work I’m doing now and the work I did ten years ago is that I’m much more willing to embrace failure and to follow any squirrel up any tree. My subjects are more open and more varied now. I’ve let go of the old concepts of the kind of poet I want to be. These days, I enjoy writing more than ever before. I’m certainly much more relaxed about the wrong turns I take. I hope that joy transfers to the reader. Chase Dimock: Let’s talk more about your first section of ghazals. The ghazal is a form that you would normally associate with poets from Persia and India in the Middle Ages, though the tradition has spread west and survived into the 21st century. What inspired you to write ghazals in the modern age and in an “Americanized” way as you describe them in the book? What does the form and style of a ghazal allow you to uniquely express? Mike James: I’ve been reading ghazals for years. I actually discovered Rumi’s ghazals, like almost everyone else, through the translations/adaptations of Coleman Barks. I love Robert Bly’s ghazals which are among his best poems. Jim Harrison and Adrienne Rich both did amazing work within the form. I’ve been deeply appreciative of the work of so many poets within the field. I love the ghazal for a lot of different reasons. Each couplet is based on a clear and specific image and has to stand alone based on both meaning and verbal excitement. That focus is a great way to avoid lazy writing. Additionally, the couplets don’t have to connect in a logical way, but they need to connect emotionally and thematically. That’s exciting because it encourages a focus on the epiphany. What writer doesn’t strive to learn something new through writing? The form allows the mind to push into other directions and to bring in images which might not be utilized in other poems. When I write ghazals I feel like I am fishing with a very large net in a very dirty river. Chase Dimock: While you begin with the formal and thematic discipline of the ghazal, you start loosening up form-wise with free verse poems, and then end with prose poems, which you earlier called “liberating.” Was this gradual formal liberation in the book intentional? I noticed that a lot of the prose poems were on themes of liberation, like “On Hedonism,” in which you write “Desire is like an easy chair. A place to rest in the hunger of yes.” How do you navigate between the discipline of writing and the liberation you want to achieve through writing? Mike James: Writing should be liberating because it allows the imagination to play. Prose poems operate on a different level because they are often, initially, confusing for readers. A reader might think a prose poem is a story or a random paragraph and that confusion is ok because if the prose poem is effective then it will allow the reader to redefine expectations. Interestingly enough, the prose poems are the oldest in this collection. I write a lot of prose poems and I wanted to write on some subjects which I considered both challenging and not traditionally poetic. That’s why I have prose poems about Batman, flip flops, and popsicles. The prose poems are part of a liberation of form and content. The ghazals were written as a sequence and I knew that I wanted to lead off with them after the reaction I received from some of my initial readers and from editors who accepted many of them right away. The middle section was actually a fluke. I really thought this would be a collection of just prose poems and ghazals because I didn’t have enough free verse poems I was happy with to make a third section. Then I started having discussions about Grant Wood with another poet friend and we began to write our versions of poems inspired by Wood’s paintings. Those poems paved the way for a couple of the other non-Grant Woods poems within that section. When I sat down to organize the collection, I wanted the reader to feel that she was moving from darkness to light. I wanted the reader to grab a rope at the bottom of a well and use it to climb out to daylight, but I wanted that reader to enjoy the climb and to see everything along the way. Chase Dimock: Let’s talk more about your section of poems on Grant Wood, including his most famous painting American Gothic. Why did his work speak to you as a poet and as a person? What about his paintings needed to be analyzed and narrated for a modern day audience? Mike James: Grant Wood has always been a name to me. I knew about American Gothic, but that’s all. Earlier this year, I read an article on an exhibit of his work. I really enjoyed the article which lead me to read a biography. At one time I was turned off by what I took as his simplicity. What I found as I studied his work was not only his amazing skill as a draftsman, but also the way he so frequently subverted the framework he operated within. There’s a clear-sightedness to his portraits which I find riveting. I’ve never read a sequence about his work and I feel that his paintings contain so much backstory that someone should explore his characters outside the canvas. As a writer who works largely away from any large cultural or university setting his regionalism appeals to me on a very practical, as opposed to a romantic, level. Chase Dimock: To continue this theme of how your work finds new subtext hidden in famous subjects, I noticed that this collection contains many poems about pop icons and celebrities, much like My Favorite Houseguest does. But, as a way to approach the concept of celebrity, I want to hear more about why you decided to write about people who are peripheral to fame, or celebrity adjacent. For example, you wrote on Truman Capote’s brother, the guy who designed the Brillo pad box (made famous by Warhol’s replicas), and an unnamed song writer who wrote about Candy Darling. What is it about figures in the margins of fame that so interests you? Is there something we can understand better about famous subjects by examining obscurity? You know, Hollywood never gets southerners right. infected cut. Turtle slow, no matter. It seems like you are concerned with how pop culture portrays parts of your identity, and also how pop culture informs your identity. Do you see this as a mutually influencing relationship, or can it one sided at times? How does your interest in marginally famous figures play into this relationship? Mike James: As I’ve mentioned at other times, I once was ashamed of my southern accent. When I was a child I thought educated people sounded like they were from somewhere else. I’m sure this came from the movies and television shows where, at best, southerners could be viewed as crafty. We like to categorize people and put them in boxes. That might be natural, but it’s not terribly healthy or helpful. I’m a firm believer that some of the people I grew up with watching how southerners were portrayed by Hollywood and then tried to mimic those portrayals. We mimic what we like and what we relate to and if those masks are too restrictive they limit our vision and our growth. I’ve always rejected the label southern poet because I’m not interested in regionalism and because my main interests are not specifically southern. Having said that, I’ve become more interested in exploring certain aspects of the south. For instance, southerners have a love/hate relationship with eccentricity that relates very well to marginality. How is fashion related to the way you play with ideas of identity and self-expression in your work? How do you see the relationship between what we wear and who we are? Mike James: I’ve always loved character actors because they are able to move from role to role. Poets should be able to do the same thing. I probably mention clothing so much because it relates to the ways in which people define themselves. I get much better service in a restaurant in a nice suit than in ratty jeans. That’s silly and wrong, but it’s absolutely true. One of the concepts I hate most in poetry is sincerity. So many people believe that we only have one self for writing poetry. It’s different for fiction writers. Nobody believes Hemingway was actually a Cuban fisherman like in The Old Man and the Sea because readers understand, it’s a work of fiction. Too many readers believe Robert Frost is the farmer of his poems or Bukowski is the dirty old man of his. Those are personas. They were crafted in the way any film star might have crafted hers. More than fashion I’m really talking about make believe. I want the reader to inhabit more than one imaginative world. I want the reader to be able to crack open definitions and then make new ones. Chase Dimock: Let’s wrap things up by looking to the future. You’re a prolific writer and your interests are always expanding in new directions. Where are some new areas you want to explore in your work? What kind of growth do you want to see in yourself as a writer down the road? 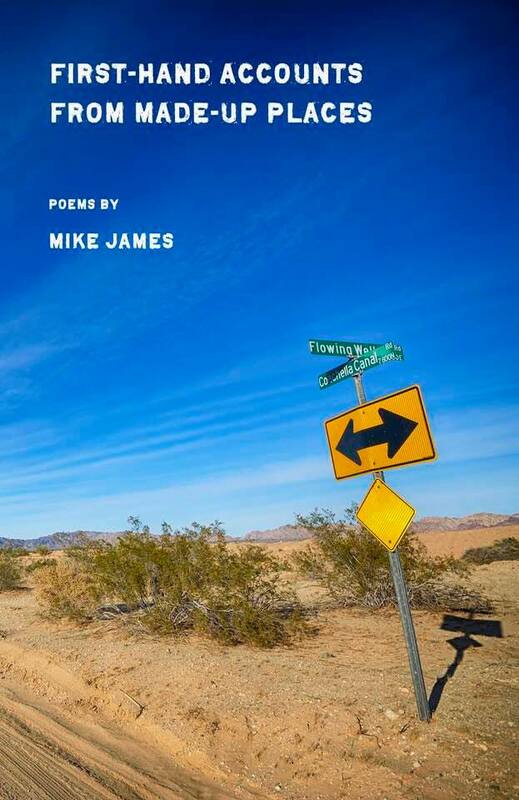 Mike James: I really love to write and I really love to re-write. I’m probably happiest when I am working on something. I have several things I’m working on right now. I have a collection of prose poems I’m about to send out. I also have a book length erasure poem I’ve been tinkering with for a while. Also, I have a lot of random pieces I’d like to assemble into a sampler over the next year or two. If the sampler comes together, it will be made up of uncollected poems and interviews, along with a few essays and reviews. The sampler is appealing to me at this point because it will allow me to gather together a lot of my disparate work (formal poems, syllabics, free verse, prose poems) and, possibly, point me in another direction. I’m very interested in collaborative poems. I’ve written a few of those with friends and I like how the poems sound different from my other poems or from the other poems of my collaborators. Collaborative poems really do tend to speak in a third voice. I often get ideas after I’ve published something about what I want to do next. Right now, I’m very interested in erasures and in the way those can push a poem in another direction. One of the fun things about erasures is that they are less dependent on personality. Of course, Delmore Schwartz said, “The ego is always at the wheel.” I may be deluding myself. First-Hand Accounts from Made-Up Places is available from Stubborn Mule Press. This entry was posted in Chase Dimock, Uncategorized and tagged American Literature, Chase Dimock, Ghazal, Mike James, Poetry, Prose Poems. Bookmark the permalink.